If you like to look good and smell great with a minimum of effort and fuss leaving you more time to work hard and play hard, then Rockface is the range for you. 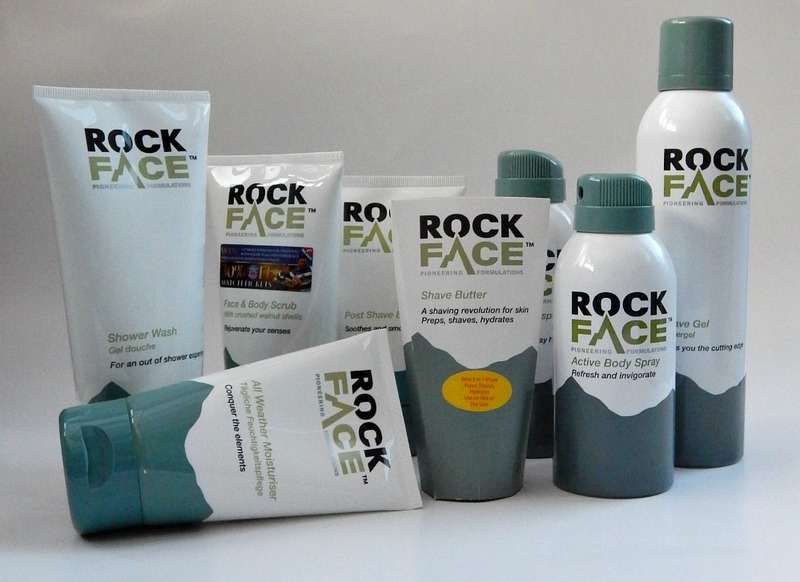 RockFace is a brand designed for a real man. All their products have the same citrusy woody fragrance so you can streamline your grooming and fragrance regime in one easy step. Recently Mark was kindly sent a range to try out. I must admit I was a little surprised by his reaction to this giant gift packet. Normally he is a quite fussy “client” when it comes to skin care – he has a few products he likes and it is not easy to even get him to try something new. I think it is all about the fragrance – yet he liked RockFace and he was more than happy to give them a try, including the face and body scrub… which I tried to make him use for years with no positive outcome. So what were Marks findings: “Good selection of useful products though I still haven’t figured out the need for an active body spray. The fragrance is indeed very attractive and I like the green colour of some products; not sure why but using them makes me happy”. From my point of view I wanted to check if a “male” version of a face and body scrub is any different to the girly ones I know, so I tried it. To my giant surprise it was an amazing experience. This is one of the best scrubs I’ve used. It is quite gentle yet does its job perfectly well and it leaves your skin unbelievable smooth… no wonder Mark’s forehead doesn’t feel like a sheet of a sand pepper any more. Mark likes it, I liked it, therefore with some confidence I can say I am sure you would like it too. Now there is only one question left: when is the after shave or a perfume with the same scent coming out to complete the routine? Now Rockface whose generosity has no bounds has very kindly offered 3 products to one of my lucky readers. The winner will be able to pick what they fancy to try out and if they are fast, it should arrive just before Christmas, so you will have one gift less to worry about. 2. One obligatory entry per reader – follow me and RockFace on Twitter and RT the tweet as stated above. Any extra RT will be counted as an additional entry. 4. The winner will receive a bundle of 3 RockFace products of their choice. The prize will be provided by RockFace. 5. Winner will be picked at random and informed within 7 working days via Twitter. 7. Closing date is Wednesday 17-12-2014 at 23:59pm, any entry made after this time will not be counted. Next > Ready, Steady, Wean! Sounds like a great product. I think my husband would like it. Sounds like a great gift idea. Thanks for sharing! My brother is picky about his skin care stuff, too! I definitely think its a scent thing but sometimes I’ll sneak in a product that he’ll try and love. This looks like a great stocking stuffer! This sounds like it would make great stocking stuffers for men. These are such a great price – I haven’t come across the range before but will definitely look out for it. This sounds kind of interesting. Perhaps Christmas will come a little early fr my guy. Never heard of this brand but it looks like a great giift for my hubby! Will have to check it out. Looks like some good products….may have to get some for the hubby! I’ve never heard of this before, it sounds great! My hubby would sure love it all! This looks like a great gift for the hubby! Is it available in the US? Perfect for my husband’s stocking! Hahaha! I am the same. Totally love Dove skincare lotion for men. Male version of beauty is surely simple. 🙂 Looks like a nice range and very reasonable too. Sounds like a great item for the man in your life. LOL! I love Mark’s comments! Sounds cool, maybe a great christmas gift for hubby! thanks!